Volunteer to Teach Kids Water Safety and Swimming in Baja this Summer. It's hard to believe with its proximity to the ocean, that Todos Santos lacks a public swimming pool, and that learning to swim is not a common childhood experience. The majority of kids here are afraid of the water, and don't know how to swim. 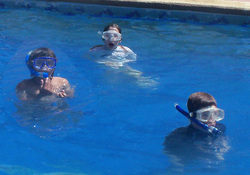 Academia Acuatica is designed to teach kids between the ages of 4 and 12 years old basic water safety and swimming. Contact Us to volunteer, register your child, or provide a scholarship to a underprivleged child.